*New and improved version of the USA-66. The Slidebar Radio is Custom Autosound’s latest innovation in the quest for a perfect classic car radio. Just slide the 'slidebar' to the right and the analog AM radio display drops away to reveal a full featured digital display. With the large OEM style push-buttons you get a perfect look in a classic dash. 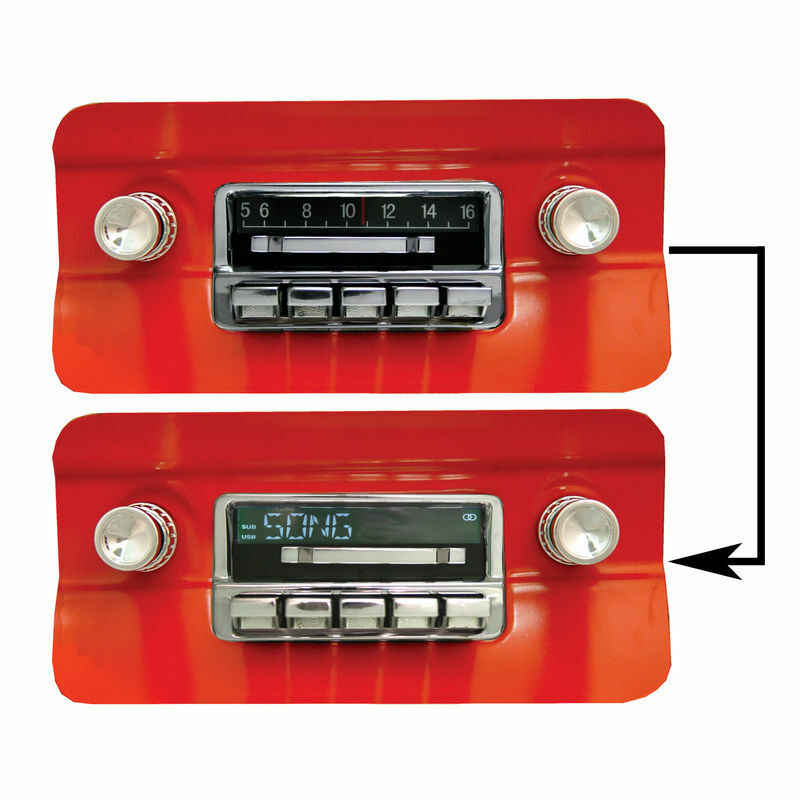 Now a radio that not only looks right and sounds great in your classic vehicle, it gives you a direct connection to today's modern audio. Although it looks classic it has the latest modern features that include an iPod dock. Navigation for the iPod includes artist/song/album/playlist all from the buttons on the radio. A great feature so you can keep the iPod hidden away in your glove box or console. The USB input is still there on the back of the radio and allows you to plug in a USB flash drive for playback of MP3/WMA song files. The alpha numeric LCD display shows the song/artist/album titles during playback of flash drive (thumb drive), iPod files and RDS radio station information. This LCD display has 7 user selectable color choices so you can match it to your other dash illumination. As an option you can get Bluetooth music streaming from your Bluetooth capable phone or Bluetooth compatible player with the BLUKIT (#91817). A2DP music streaming allows you to advance the songs on your phone buy using the track up/down button on the radio. It will also mute the music while to take a hands free phone call through the radio. With 300 watts peak the radio should have all the power you may need, if you want more there are four pre-outs jacks and a subwoofer out on the back of the radio for optional amplifiers. The back of the radio also has auxiliary audio input for satellite radio or any portable player you may wish to use. If CD's are your thing we have you covered as this radio will control an optional 6 disc changer USA-CD60 or our CD1 compact size CD/DVD mp3 compatible player.